Matt bashfully poses a wide grin on his face as he read Joanne’s letter on the morning of their wedding day. With a baritone voice that would make Barry White writhe in envy, Matt outlines Joanne’s deepest feelings for him written in a simple letter, thoughts of how Matt’s imposing personality could bring Joanne out of her shell, and how his courage and strength in life adds to her own. In the same vein, Joanne shyly wiped tears from her eyes as she read Matt’s own confessions, expressing his eagerness for her to be the mother of his children, and to join him on his life’s journey and beyond. A tender exchange of love letters would begin our videographers’ day of filming, and a lifetime together for Matt and Joanne. 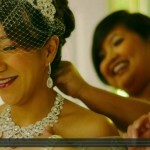 Joanne looked stunning on film in a simple white wedding gown, while Matt chose a formal suit and bow-tie for the evening affairs, and once the couple were ready, our crew followed along to The Berkeley Church, which would serve as the setting for the nights’ ceremony and celebration. In a backdrop of beige candles, violet-themed ambient lighting and purple petals which traced the path of the ceremony, the couple were wed in an environment of both applause and laughter. The best man, and ring bearer, had unintentionally dropped the wedding rings during the procession, much to the second-hand chagrin of our videographers. Yet the light-hearted crowd had burst into laughter at such a slapstick slip-up, and the couple were left unphased, and jokingly poked fun at the scene’s absurdity. The ceremony took place in the brightly-lit upper attic of the restored Victorian church, a fitting match for the mostly affluent young crowd who formed the bulk of the weddings’ well-wishing congregation. The first kiss was met with “’oohs” and “aahs” from the very same crowd, drawing a contrast to the seemingly school-age love that Matt and Joanne had for each other with the reality of them and their friends’ lives as young-professionals at the prime of their lives. The ceremony afterward would take place in the spacious atrium of the church. The newlyweds’ separate entrances were greeted with endless applause, and a proper toast to the couple echoed our very own feelings about the weddings’ atmosphere, “live life to the fullest, and laugh until you cry”. 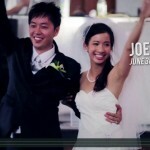 Filming the first dance for our wedding videographers was a very touching task, as the slow dance of bride and groom in full embrace amidst a dimly lit room with the flashes of the crowds’ cameras reminiscent of lightning looked like the couple were weathering a storm in the darkness, together as one. On a less-solemn note, the standard fare of cake-cutting, embarrassingly slurred speeches and silly wedding games would continue the light-hearted theme of the night. With the evening winding down, we at SDE Weddings, Toronto’s premier wedding videography and cinematography group, were left with nothing but respect and admiration for Matt and Joanne’s most celebrated union, and wish them all the best in their life. 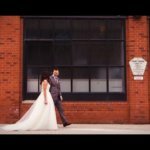 Please enjoy the following special highlight video that our videographers and cinematographers made for Matt and Joanne’s wedding day.